January 5, 2017 by Technical Management, Inc. The Value Adjusted Total Evaluated Price (VATEP) process provides offerors with the exact value the source selection (SS) evaluation will place on higher rated performance. While its purpose is to make the subjective and judgmental trade-off source selection process more “objective,” the VATEP process has profound implications for contractor pre-RFP Positioning to Win activities. This post, the first in a two-part series, addresses “Where and When You Make It.” Because the VATEP process is new, in a later post we will summarize lessons learned from VATEP source selections. Our November 2016 post, Selling Beyond Threshold Performance, discusses the central questions the contractor must address in quantifying and selling the value of enhanced performance. The article also presented the necessary and sufficient conditions to ensure success. Building on the insights presented in November, this post focuses on the contractor’s collaborative role with the customer in helping shape requirements and defining the military utility value of beyond threshold performance. The Acquisition Challenge. VATEP shifts the determination of best value from what has largely been a subjective trade-off process during source selection evaluation to an upfront (in advance), alleged rational objective definition of value. Value of higher performance and lower technical risk are quantified for evaluation purposes. The Requirements Officer (RO) is responsible for identifying the performance enhancements to be considered as well as defining the value of higher performance. Needless to say, this episodic “left shift” portends a complicated task with the results subject to challenge within the agency and by offerors. Which requirements are discriminators to balance performance and price to maximize program objectives? And, how many are essential given the operational character of the mission and product combination? Do enhancement values assigned to higher performance and lower risk have a substantial relationship to operational benefits and/or cost savings? Are value assessments supported by data and analysis? Are values assigned to various enhancements reasonable in the context of contribution to mission capability? Requirements Officer and Industry Input. Despite having access to government analysis organizations and development labs, the RO needs industry input on product performance that is feasible and costs that are reasonable. Responses to RFIs and “white papers” help, but identifying the discriminating requirements and monetizing their value in the context of mission utility and cost is complex and difficult. Further, once determined, the results are difficult to defend and will be subject to iterations, potential protests, and change. To wit, multiple draft RFPs were issued for 3DELLR. And, the final RFP for the T-X came years after the program was initiated. Thus, a few offeror personnel (with a trusting customer relationship) who can anticipate and responsively (days, not weeks) provide issue-driven analysis and rationale to collaboratively address the RO’s issues are likely to be welcomed. VATEP Adds a New Dimension to Shaping the Acquisition. Offerors know they must collaborate with the customer to help shape the acquisition into something they can best win. VATEP adds a new dimension to acquisition shaping. To minimize the potential for a sustainable protest, deriving the performance enhancement and low-risk quantitative values need to reflect inputs from offerors as well as users and others in the customer set. This collaboration, as well as settling on the final ground rules, is a long process. The ultimate winner will have actively supported the customer set, both directly and indirectly, during the pre-RFP period. Having gained valuable insights from the process, this offeror is better positioned to win. 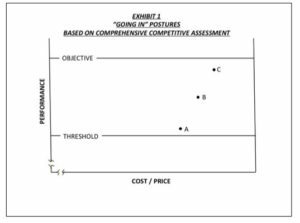 – What performance capability (threshold, threshold plus, or objective) will the competitor to beat likely offer? What level of performance is the competitor to beat likely to assume our team will offer? – What level of evidence of projected performance will be successful in establishing (or diminishing) the SSA’s confidence of success? – What is the likely cost of the competitor to beat? – Is winning the award strategic enough to the competitor that they are likely to offer a pre-emptive price to ensure winning? With answers to these questions “going in” to the pre-RFP positioning phase, an informed “What will win, why, and how?” Win Strategy (WS) and Price to Win (PTW) can be derived and implemented. Along the way these must be updated and iterated as the above questions are re-addressed. 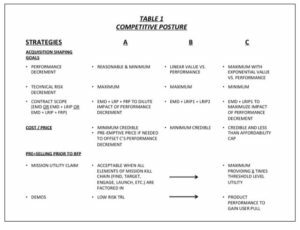 Exhibit 1 below shows “going in” pre-RFP postures (performance and cost/price combinations) for offerors A, B, and C. Also, shown in Table 1 are the elements of the offeror’s likely strategies. Each of these strategies result in diverse thrusts by competitors (in pre-RFP phase) as the customer identifies the discriminating performance enhancements and assigns values to performance and risk decrements. Simulation of Combinations. A model simulating the possible spectrum of terms in VATEP equations above is a must. This helps protect against being “blindsided” by an offeror’s combination (performance decrement, risk decrement, TPP, and possible pre-emptive TPP) that you might not have considered. TMI’s proven Creating A Win-Competitive Assessment and Strategy Derivation (Part I) and Simulated Competition (Part II) has been perfected on hundreds of winning efforts. For additional information contact dandudas@tmiwins.com.